The world famous resort of Cancun is an international resort with excellent hotels, loads of nightlife and lovely white sand beaches. The original town of Cancun was a sleepy fishing village that over the last thirty plus years has grown into one of the most popular places in the Caribbean. The hotel zone is home to many hotels and offers something for all tastes and budgets. The white sandy beaches stretches more than 20kms and offers access to the beautiful turquoise waters which are perfect for swimming, snorkelling or enjoying some watersports. Cancun Holidays - Lively or Laid Back! 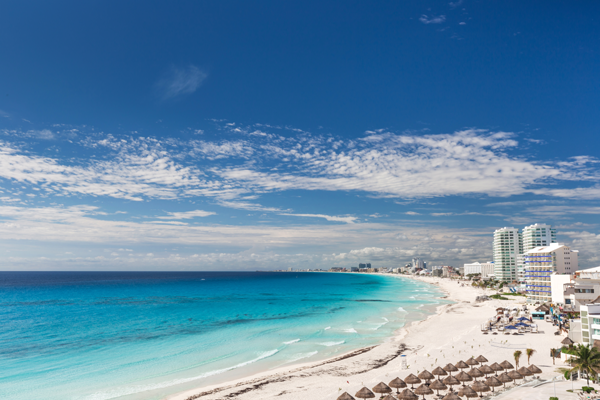 Holidays in Cancun can be as lively or laid back as you fancy. The hotel zone is packed with lively bars, restaurants and clubs where international DJ's spin the latest tunes. There is plenty of shopping opportunities to with malls offering all the latest designer brands. For a more laid back affair, many of the restaurants offer a quiet retreat to enjoy a quiet meal and relaxing night. Excursions are plentiful and the most popular ones are usually boat trips, however for a more cultured affair the ancient ruins of the Mayan civilisation are scattered throughout the Yucatan Peninsula and excursions to the many sites are available with many operators. The ancient walled city of Tulum is around a 90 minute drive away. Another popular excursion is the swimming with Dolphins excursion, a chance to swim alongside one in the Caribbean Sea. Whatever you fancy on your Cancun holiday we will have something for you. Give us a call today for more details or browse our website. Call our Mexico Holiday Experts today on Freephone 0800 091 4935!